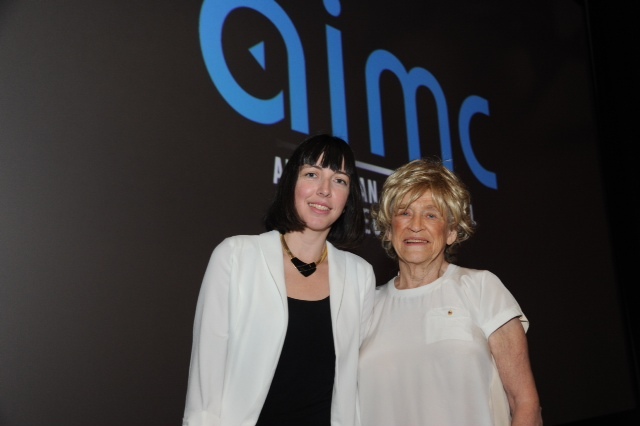 The 2015 Natalie Miller Fellowship grant was awarded to Courtney Botfield on Monday morning, by Natalie Miller at the Australian International Movie Convention, the most prestigious annual event in the industry attracting distributors, exhibitors, producers and filmmakers from Australia and New Zealand. Established in 2011 in recognition of the unique contribution of Natalie Miller AO, the Fellowship awards a grant of $10,000 to a woman in the Australian screen industry who has demonstrated initiative, entrepreneurship and excellence. The only grant of its kind in the country, the NMF was created to recognise and nurture the next generation of female leaders in the Australian Screen Industry, and inspire them to achieve outstanding success at the most senior levels of the business. Courtney Botfield, a distribution specialist with over 15 years experience in independent film, has recently developed a focus on the burgeoning field of Impact Producing, targeting films with strong social messaging and the potential for creating real change. With her grant, she plans to fill the market gap in this area, through increasing her knowledge and practice of sourcing innovative pathways for the financing and distribution of these types of films. Botfield plans to attend the 2016 Media That Matters Conference in Washington DC, meet leading social impact and analysis practitioners in New York, and engage a business mentor aligned with the philanthropic and social enterprise sectors. This year’s applicants came from all major Australian states and were assessed by a selection panel of highly respected and distinguished screen professionals from across several sectors of the industry. The Natalie Miller Fellowship is funded from donations made to the Natalie Miller Fellowship Endowment Fund and through the generous support of Film Victoria. Past recipients who have represented the NMF’s vision to develop, inspire and provide leadership include 2014’s winner Rebecca Hammond (Deluxe Australia), 2013’s winner Harriet Pike (WildBear Entertainment), and 2012’s winner Rachel Okine, (StudioCanal). You can support us in nurturing the next generation of female leaders in the Australian screen community. Every dollar helps.